Riding a bicycle to a white sandy beach. Hasanul recalls fondly of the times when he and his brother Suhaimi would cycle to the nearby beach where there are crabs, or kerang everywhere, and they would be picking seashells and playing together. Twirl and Pain is a painting of the very bicycle he rode as a child. 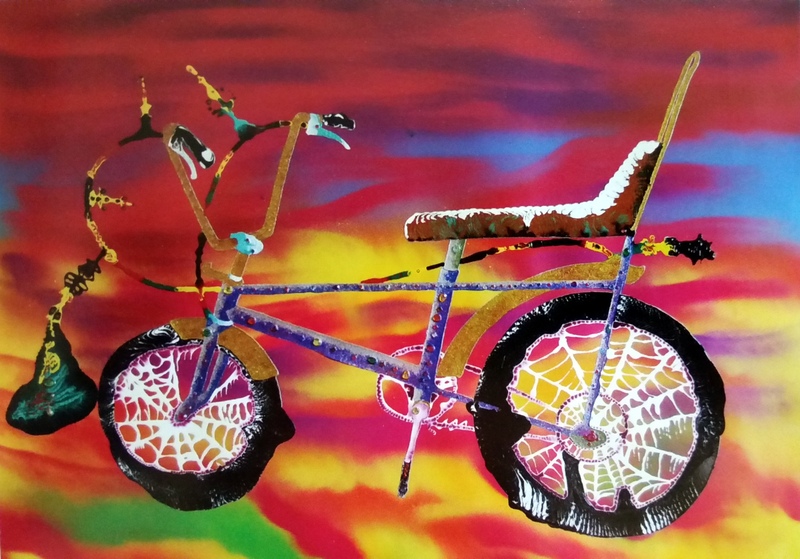 Giving it a life and soul, Hasanul reflects this with a dreamy sky in colourful bright hues, bicycle floating in mid-air, and a pouch carrying its soul hanging off the brake wires. The bicycle frame is decorated in rhinestones, giving a magical touch to what was once a child’s ride to a world of adventure and exploration. The bicycle is long gone, but the memory of it lives forever in Hasanul’s mind, and he has immortalised this bicycle in Twirl and Pain. What is the one experience that you will never forget? 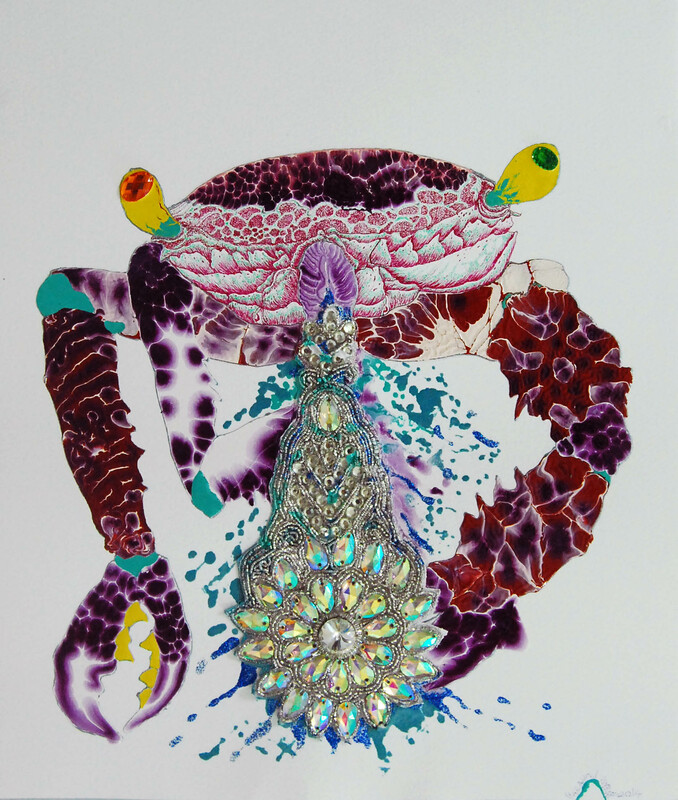 Hasanul commemorates and pays tribute to his mother in many of the works – the feminine touch to the subjects such as the batik, songket, gemstones all represent the woman who has been such a strong influence in his life. How did your journey in art begin? It all began when my brother took me to Amron Omar Studio ( one of the leading figurative painters ) when I’m 12 years old, it was the first experience where I had an insight look at an artist’s life in the studio, complete with wet oil paint and turpentine. I think the most interesting project is Back From Planet Luvox. I try to recollect memories that i had since i can remember. Reexamine, study, restudy, revisit, recompost the whole thing and try to present it in visual format. Having my own garden and that I can produce local produce. In the series, Hasanul brings the elements of his garden unto paper – from plants to caterpillars, bees, butterflies, birds, and everything in between. The time he spent in the garden with his mother formed a significant part of his childhood memory, and is also the muse to his current work. In your opinion, what is the most important trait of an artist, and why? Being creative, artistic, and sincere, these are the important criteria for an artist. Hasanul’s experimentative interest in materials is such a treat – the result of arduous efforts in testing new media is evident in Back From Planet Luvox, where non-conventional uses of oil paint, acrylics, industrial materials, ink and spray paint all come together harmoniously. When I am bored, I …. Go to used clothing shops, eat at Bangladeshi Restaurants or play with Playdoh. Hasanul introduced us to his son too, whom he is very close to and who is also a contributor and critique of his works, particularly on his pen drawings. This also explains why he plays with Playdoh when he isn’t working! So, what is in store for us after Back From Planet Luvox? Hasanul is now busy preparing for upcoming fairs in Taiwan and Singapore for the remaining of the year. We are more than proud to have him carrying the Malaysian flag in the international art arenas, and thank him for his time in sharing so much with us! Unless stated otherwise, pictures are courtesy of Richard Koh Fine Arts. Posted on May 4, 2014 by ChalkandRaddyPosted in PeopleTagged Chalk and Raddy, chalkandraddy, Hasanul Isyraf Idris, Malaysia Art, Malaysia Emerging Artist, Richard Koh Fine Art.